January 2 will be a day of many, many announcements - don't forget to watch the broadcast to learn all about our long list of big plans for 2018! Beyond that, we thought we'd kick off 2018 with a special miniseries to introduce ourselves to aspiring members of tastynation. We're sad that Everyday Trader will be staying behind in 2017, but so thrilled to see Mike Butler back in action - with Nick Battista, no less! Trade Managers aims to take a no-nonsense approach to wisely managing your trades (winners or losers) with the time you have on hand. Jessica, an editor here at tastytrade, abandoned trading a while back but is looking to jump back in and improve her skills. She'll be guided by Mike! The world of derivatives is not exactly a walk in the park. Luckily, we have Dr. Jim on hand to lead us through some of the more intricate ideas that this space has to offer, and show us how to apply these abstract concepts into our trading. Not for the faint of heart! 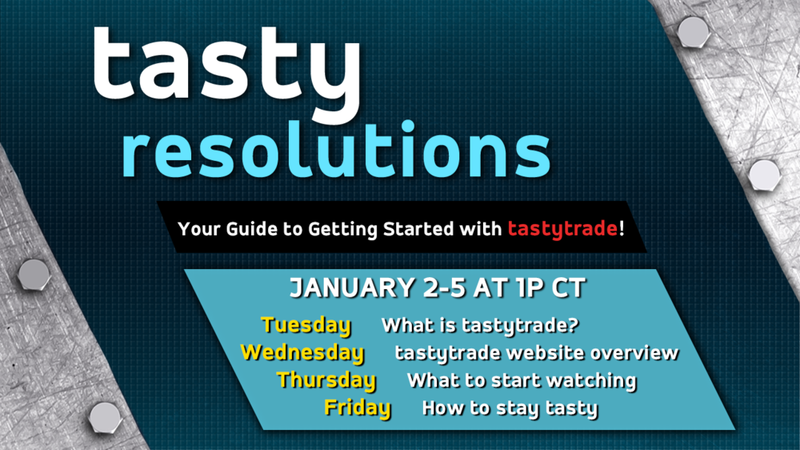 Happy new year from all of us here at tastytrade! As always, we love your comments and feedback about our programming (current and future!) - leave us a comment below or drop us a line at support@tastytrade.com!